Canon-ish is a play on what is classified as canonic art in the digital age. Canon-ish was created using search engine results for works accepted to be masterpieces in the canon of art history. 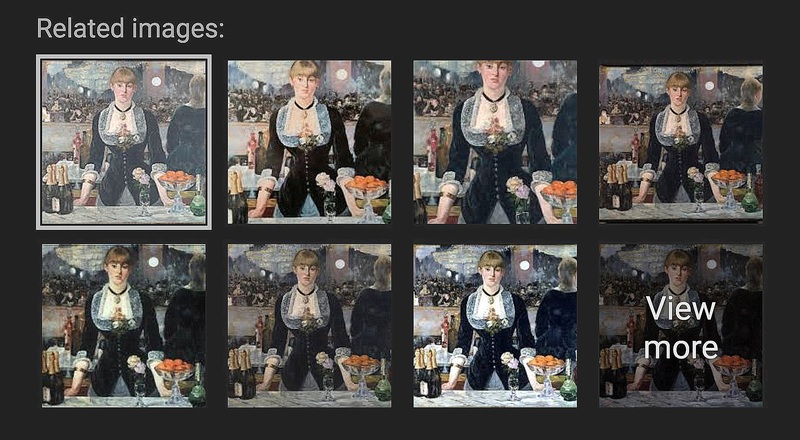 Each search turns up hundreds of versions of these paintings, each varying slightly in color and cropping. Prompted by the proliferation of images in the contemporary art world and on the internet, Canon-ish explores what is considered art versus what is seen as a reproduction, and who is considered a genius artist versus who is seen as derivative. In effect, I aim to question why reproduced, digital images of canonic pieces are often more easily accepted as works of art than conceptual works being made today. Emily Bass is a curator, artist, and the Arts Editor of the Boston Hassle. She is interested in how our relationships to images and objects change over time, a topic that she has explored through makeup, fashion, and now, images in the canon of art history.